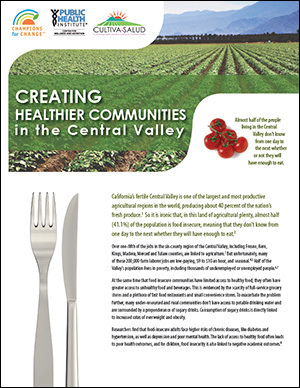 The Central Valley Training and Resource Center (TRC), Cultiva la Salud and the six Central Valley local health departments’ (LHDs) Nutrition Education and Obesity Prevention programs have prepared this issue brief to highlight the importance of CalFresh and SNAP-Ed and some of the programs that are making a positive difference in reducing hunger, empowering families to make better choices and providing an economic stimulus to Central Valley communities. The brief is intended to serve as a talking piece that lifts up these critical issues and the great work that’s happening in SNAP-Ed as well as highlights key recommendations that build on these current successes. The brief can be paired with the County and Statewide SNAP-Ed Profiles. Archive of all the Central Valley TRC newsletters with helpful information and resources.